The week before Sapphire, SAP unveiled a number of significant enhancements. VMware 6.0 is now supported for a production VM (notice the lack of a plural); more on that below. Hybris Commerce, a number of apps surrounding SoH and S/4HANA is now supported on IBM Power Systems. Yes, you read that right. The Holy Grail of SAP, S/4 or more specifically, 1511 FPS 02, is now supported on HoP. Details, as always, can be found in SAP note: 2218464 – Supported products when running SAP HANA on IBM Power Systems . The importance of this announcement, or should I say non-announcement as you had to be watching the above SAP note as I do on almost a daily basis because it changes so often, was the only place where this was mentioned. This is not a dig at SAP as this is their characteristic way of releasing updates on availability to previously suggested intentions and is consistent as this was how they non-announced VMware 6.0 support as well. Hasso Plattner, various SAP executives and employees, in Sapphire keynotes and other sessions, mentioned support for IBM Power Systems in almost a nonchalant manner, clearly demonstrating that HANA on Power has moved from being a niche product to mainstream. Also, of note, Pfizer delivered an ASUG session during Sapphire including significant discussion about their use of IBM Power Systems. I was particularly struck by how Joe Caruso, Director, ERP Technical Architecture at Pfizer described how Pfizer tested a large BW environment on both a single scale-up Power System with 50 cores and 5TB of memory and on a 6-node x86 scale-out cluster (tested on two different vendors, not mentioned in this session but probably not critical as their performance differences were negligible), 60-cores on each node with 1 master node and 4 worker nodes plus a not-standby. After appropriate tuning, including utilizing table partitioning on all systems, including Power, the results were pretty astounding; both environments performed almost identically, executing Pfizer’s sample set, composed of 75+ queries, in 5.7 seconds, an impressive 6 to 1 performance advantage on a per core basis, not including the hot-standby node. What makes this incredible is that the official BW-EML benchmark only shows an advantage of 1.8 to 1 vs. the best of breed x86 competitor and another set of BW-EML benchmark results published by another x86 competitor shows scale-out to be only 15% slower than scale-up. For anyone that has studied the Power architecture, especially POWER8, you probably know that it has intrinsics that suggest it should handle mixed, complex and very large workloads far better than x86, but it takes a customer executing against their real data with their own queries to show what this platform can really do. Consider benchmarks to be the rough equivalent of a NASCAR race car, with the best of engineering, mechanics, analytics, etc, vs. customer workloads which, in this analogy, involves transporting varied precious cargo in traffic, on the highway and on sub-par road conditions. Pfizer decided that the performance demonstrated in this PoC was compelling enough to substantiate their decision to implement using IBM Power Systems with an expected go-live later this year. Also, of interest, Pfizer evaluated the reliability characteristics of Power, based in part on their use of Power Systems for conventional database systems over the past few years, and decided that a hot-standby node for Power was unnecessary, further improving the overall TCO for their BW project. I had not previously considered this option, but it makes sense considering the rarity of Power Systems to be unable to handle predictable, or even unpredictable faults, without interrupting running workloads. Add to this, for many, the loss of analytical environments is unlikely to result in significant economic loss. Also in a Sapphire session, Steve Parker, Director Application Development, Kennametal, shared a very interesting story about their journey to HANA on Power. Though they encountered quite a few challenges along the way, not the least being that they started down the path to Suite on HANA and S/4HANA prior to it being officially supported by SAP, they found the Power platform to be highly stable and its flexibility was of critical importance to them. Very impressively, they reduced response times compared to their old database, Oracle, by 60% and reduced the run-time of a critical daily report from 4.5 hours to just 45 minutes, an 83% improvement and month end batch now completes 33% faster than before. Kennametal was kind enough to participate in a video, available on YouTube at: https://www.youtube.com/watch?v=8sHDBFTBhuk as well as a write up on their experience at: http://www-03.ibm.com/software/businesscasestudies/us/en/gicss67sap?synkey=W626308J29266Y50. As I mentioned earlier, SAP snuck in a non-announcement about VMware and how a single production VM is now supported with VMware 6.0 in the week prior to Sapphire. SAP note 2315348 – describes how a customer may support a single SAP HANA VM on VMware vSphere 6 in production. One might reasonably question why anyone would want to do this. I will withhold any observations on the mind set of such an individual and instead focus on what is, and is not, possible with this support. What is not possible: the ability to run multiple production VMs on a system or to mix production and non-prod. What is possible: the ability to utilize up to 128 virtual processors and 4TB of memory for a production VM, utilize vMotion and DRS for that VM and to deliver DRAMATICALLY worse performance than would be possible with a bare-metal 4TB system. Why? Because 128 vps with Hyperthreading enabled (which just about everyone does) utilizes 64 cores. To support 6TB today, a bare-metal Haswell-EX system with 144 cores is required. If we extrapolate that requirement to 4TB, 96 cores would be required. Remember, SAP previously explained a minimum overhead of 12% was observed with a VM vs. bare-metal, i.e. those 64 cores under VMware 6.0 would operate, at best, like 56 cores on bare-metal or 42% less capacity than required for bare-metal. Add to this the fact that you can’t recover any capacity left over on that system and you are left with a hobbled HANA VM and lots of leftover CPU resources. So, vMotion is the only thing of real value to be gained? Isn’t HANA System Replication and a controlled failover a much more viable way of moving from one system to another? Even if vMotion might be preferred, does vMotion move memory pages from source to target system using the EXACT same layout as was implemented on the source system? I suspect the answer is no as vMotion is designed to work even if other VMs are currently running on the target system, i.e. it will fill memory pages based on availability, not based on location. As a result, this would mean that all of the wonderful CPU/memory affinity that HANA so carefully established on the source system would likely be lost with a potentially huge impact on performance. Almost two years ago, I speculated about the potential value of a HANA on Power solution. In June, 2014, SAP announced a Test and Evaluation program for Scale-up BW HANA on Power. That program shifted into high gear in October, 2014 and roughly 10 customers got to start kicking the tires on this solution. Those customers had the opportunity to push HANA to its very limits. Remember, where Intel systems have 2 threads per core, POWER8 has up to 8 threads per core. Where the maximum size of most conventional Intel systems can scale to 240 threads, the IBM POWER E870 can scale to an impressive 640 threads and the E880 system can scale to 1536 threads. This means that IBM is able to provide an invaluable test bed for system scalability to SAP. As SAP’s largest customers move toward Suite “4” HANA (S4HANA), they need to have confidence in the scalability of HANA and IBM is leading the way in proving this capability. A Ramp-up program began in March with approximately 25 customers around the world being given the opportunity to have access to GA level code and start to build out BW POC and production environments. This brings us forward to the announcement by SAP this week @ SapphireNow in Orlando of the GA of HANA on Power. SAP announced that customers will have the option of choosing Power for their BW HANA platform, initially to be used in a scale-up mode and plans to support scale-out BW, Suite on HANA and the full complement of side-car applications over the next 12 to 18 months. Even the most loyal IBM customer knows the comparative value of other BW HANA solutions already available on the market. To this end, IBM announced new “solution editions”. A solution edition is simply a packaging of components, often with special pricing, to match expectations of the industry for a specific type of solution. “Sounds like an appliance to me” says the guy with a Monty Python type of accent and intonation (no, I am not making fun of the English and am, in fact, a huge fan of Cleese and company). True, if one were to look only at the headline and ignore the details. In reality, IBM is looking toward these as starting points, not end points and most certainly not as any sort of implied limitation. Remember, IBM Power Systems are based on the concept of Logical Partitions using Power Virtualization Manager (PVM). As a result, a Power “box” is simply that, a physical container within which one or multiple logical systems reside and the size of each “system” is completely arbitrary based on customer requirements. So, a “solution edition” simply defines a base configuration designed to be price competitive with the industry while allowing customers to flexibly define “systems” within it to meet their specific requirements and add incremental capability above that minimum as is appropriate for their business needs. While a conventional x86 system might have 1TB of memory to support a system that requires 768GB, leaving the rest unutilized, a Power System provides for that 768GB system and allows the rest of the memory to be allocated to other virtual machines. Likewise, HANA is often characterized by periods of 100% utilization, in support of instantaneous response time demanded of ad-hoc queries, followed by unfathomably long periods (in computer terms) of little to no activity. Many customers might consider this to be a waste of valuable computing resource and look forward to being able to harness this for the myriad of other business purposes that their businesses actually depend on. This is the promise of Power. Put another way, the appliance model results in islands of automation like we saw in the 1990s where Power continues the model of server consolidation and virtualization that has become the modus operandi of the 2000s. But, says the pitchman for a made for TV product, if you call right now, we will double the offer. If you believe that, then you are probably not reading my blog. If a product was that good, they would not have to give you more for the same price. Power, on the other hand, takes a different approach. Where conventional BW HANA systems offer a maximum size of 2TB for a single node, Power has no such inherent limitations. To handle larger sizes, conventional systems must “scale-out” with a variety of techniques, potentially significantly increased costs and complexity. Power offers the potential to simply “scale-up”. Future IBM Power solutions may be able to scale-up to 4TB, 8TB or even 16TB. In a recent post to this blog, I explained that to match the built in redundancy for mission critical reliability of memory in Power, x86 systems would require memory mirroring at twice the amount of memory with an associated increase in CPU and reduction in memory bandwidth for conventional x86 systems. SAP is pushing the concepts of MCOS, MCOD and multi-tenancy, meaning that customers are likely to have even more of their workloads consolidated on fewer systems in the future. This will result in demand for very large scaling systems with unprecedented levels of availability. Only IBM is in position to deliver systems that meet this requirement in the near future. Also a planning guide for HANA on Power has been published at http://www-03.ibm.com/support/techdocs/atsmastr.nsf/WebIndex/WP102502 . Is VMware ready for HANA production? Virtualizing SAP HANA with VMware in productive environments is not supported at this time, but according to Arne Arnold with SAP, based on his blog post of Nov 5, http://www.saphana.com/community/blogs/blog/2013/11/05/just-a-matter-of-time-sap-hana-virtualized-in-production, they are working hard in that direction. Clearly memory can be assigned to individual partitions with VMware and to a more limited extent, CPU resources may also be assigned although this may be a bit more limited in its effectiveness. The issues that SAP will have to overcome, however, are inherent limitations in scalability of VMware partitions, I/O latency and potential contention between partitions for CPU resources. As I discussed in my blog post late last year, https://saponpower.wordpress.com/2012/10/23/sap-performance-report-sponsored-by-hp-intel-and-vmware-shows-startling-results/, VMware 5.0 was proven, by VMware, HP and Intel, to have severe performance limitations and scalability constraints. In the lab test, a single partition achieved only 62.5% scalability, overall, but what is more startling is the scalability between each measured interval. From 4 to 8 threads, they were able to double the number of users, thereby demonstrating 100% scalability, which is excellent. From 8 to 16 threads, they were only about to handle 66.7% more users despite doubling the number of threads. From 16 to 32 threads, the number of users supported increased only 50%. Since the time of the study being published, VMware has released vSphere 5.1 with an architected limit of 64 threads per partition and 5.5 with an architected limited of 128 threads per partitions. Notice my careful wording of architected limit not the official VMware wording, of “scalability”. Scaling implies that with each additional thread, additional work can be accomplished. Linear scaling implies that each time you double the number of threads, you can accomplish twice the amount of work. Clearly, vSphere 5.0 was unable to attain even close to linear scaling. But now with the increased number of threads supported, can they achieve more work? Unfortunately, there are no SAP proof points to answer this question. All that we can do is to extrapolate the results from their earlier published results assuming the only change was the limitation in the number of architected threads. 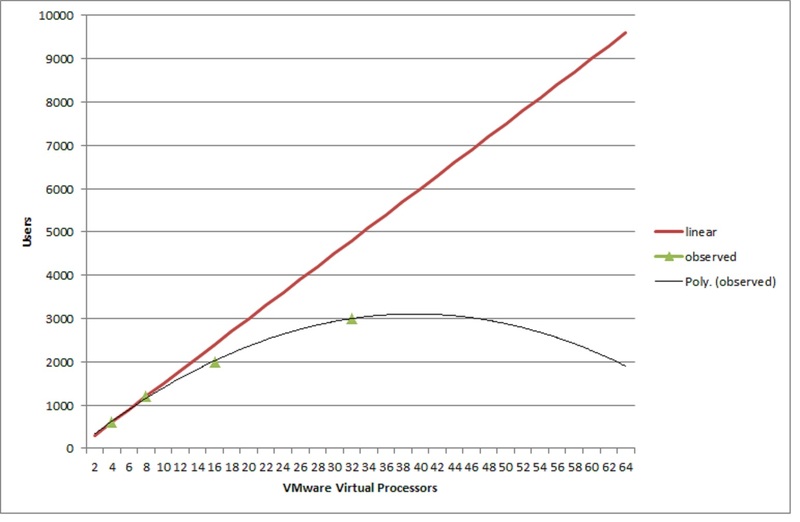 If we use the straight forward Microsoft Excel “trendline” function to project results using a Polynomial with an order of 2, (no, it has been way to long since I took statistics in college to explain what this means but I trust Microsoft (lol)) we see that a VMware partition is unlikely to ever achieve much more throughput, without a major change in the VMware kernel, than it achieved with only 32 threads. Here is a graph that I was able to create in Excel using the data points from the above white paper. Remember, at 32 threads, with Intel Hyperthreading, this represents only 16 cores. As a 1TB BW HANA system requires 80 cores, it is rather difficult to imagine how a VMware partition could ever handle this sort of workload much less how it would respond to larger workloads. Remember, 1TB = 512GB of data space which, at a 4 to 1 compression ratio, equal 2TB of data. VMware starts to look more and more inadequate as data size increases. And if a customer was misled enough by VMware or one of their resellers, they might think that using VMware in non-prod was a good idea. Has SAP or a reputable consultant ever recommended using use one architecture and stack in non-prod and a completely different one in prod? So, in which case would virtualizing HANA be a good idea? As far as I can tell, only if you are dealing with very small HANA databases. How small? Let’s do the math: assuming linear scalability (which we have already proven above is not even close to what VMware can achieve) 32 threads = 16 cores which is only 20% of the capacity of an 80 core system. 20% of 2TB = 400GB of uncompressed data. At the 62.5% scalability described above, this would diminish further to 250GB. There may be some side-car applications for which a large enterprise might replicate only 250GB of data, but do you really want to size for the absolute maximum throughput and have no room for growth other than chucking the entire system and moving to newer processor versions each time they come out? There might also be some very small customers which have data that can currently fit into this small a space, but once again, why architect for no growth and potentially failure? Remember, this was a discussion only about scalability, not response time. Is it likely that response time also degrades as VMware partitions increase in size? Silly me! I forgot to mention that the above white paper showed response time increasing from .2 seconds @ 4 threads to 1 second @ 32 threads a 400% increase in response time. Isn’t the goal of HANA to deliver improved performance? Kind of defeats the purpose if you virtualize it using VMware! Is the SAP 2-tier benchmark a good predictor of database performance? Answer: Not even close, especially for x86 systems. Sizings for x86 systems based on the 2-tier benchmark can be as much as 50% smaller for database only workloads as would be predicted by the 3-tier benchmark. Bottom line, I recommend that any database only sizings for x86 systems or partitions be at least doubled to ensure that enough capacity is available for the workload. At the same time, IBM Power Systems sizings are extremely conservative and have built in allowances for reality vs. hypothetical 2-tier benchmark based sizings. What follows is a somewhat technical and detailed analysis but this topic cannot, unfortunately, be boiled down into a simple set of assertions. The details: The SAP Sales and Distribution (S&D) 2-tier benchmark is absolutely vital to SAP sizings as workloads are measured in SAPS (SAP Application Performance Standard)[i], a unit of measurement based on the 2-tier benchmark. The goal of this benchmark is to be hardware independent and useful for all types of workloads, but the reality of this benchmark is quite different. The capacity required for the database server portion of the workload is 7% to 9% of the total capacity with the remainder used by multiple instances of dialog/update servers and a message/enqueue server. This contrasts with the real world where the ratio of app to DB servers is more in the 4 to 1 range for transactional systems and 2 or 1 to 1 for BW. In other words, this benchmark is primarily an application server benchmark with a relatively small database server. Even if a particular system or database software delivered 50% higher performance for the DB server compared to what would be predicted by the 2-tier benchmark, the result on the 2-tier benchmark would only change by .07 * .5 = 3.5%. How then is one supposed to size database servers when the SAP Quicksizer shows the capacity requirements based on 2-tier SAPS? A clue may be found by examining another, closely related SAP benchmark, the S&D 3-tier benchmark. The workload used in this benchmark is identical to that used in the 2-tier benchmark with the difference being that in the 2-tier benchmark, all instances of DB and App servers must be located within one operating system (OS) image where with the 3-tier benchmark, DB and App server instances may be distributed to multiple different OS images and servers. Unfortunately, the unit of measurement is still SAPS but this represents the total SAPS handled by all servers working together. Fortunately, 100% of the SAPS must be funneled through the database server, i.e. this SAPS measurement, which I will call DB SAPS, represents the maximum capacity of the DB server. Now, we can compare different SAPS and DB SAPS results or sizing estimates for various systems to see how well 2-tier and 3-tier SAPS correlate with one another. Turns out, this is easier said than done as there are precious few 3-tier published results available compared to the hundreds of results published for the 2-tier benchmark. But, I would not be posting this blog entry if I did not find a way to accomplish this, would I? I first wanted to find two results on the 3-tier benchmark that achieved similar results. Fortunately, HP and IBM both published results within a month of one another back in 2008, with HP hitting 170,200 DB SAPS[ii] on a 16-core x86 system and IBM hitting 161,520 DB SAPS[iii] on a 4-core Power system. While the stars did not line up precisely, it turns out that 2-tier results were published by both vendors just a few months earlier with HP achieving 17,550 SAPS[iv] on the same 16-core x86 system and IBM achieving 10,180 SAPS[v] on a 4-core and slightly higher MHz (4.7GHz or 12% faster than used in the 3-tier benchmark) Power system than the one in the 3-tier benchmark. Notice that the HP 2-tier result is 72% higher than the IBM result using the faster IBM processor. Clearly, this lead would have even higher had IBM published a result on the slower processor. While SAP benchmark rules do not allow for estimates of slower to faster processors by vendors, even though I I am posting this as an individual not on behalf of IBM, I will err on the side of caution and give you only the formula, not the estimated result: 17,550 / (10,180 * 4.2 / 4.7) = the ratio of the published HP result to the projected slower IBM processor. At the same time, HP achieved only a 5.4% higher 3-tier result. How does one go from almost twice the performance to essentially tied? Easy answer, the IBM system was designed for database workloads with a whole boatload of attributes that go almost unused in application server workloads, e.g. extremely high I/O throughput and advanced cache coherency mechanisms. One might point out that Intel has really turned up its game since 2008 with the introduction of Nehalem and Westmere chips and closed the gap, somewhat, against IBM’s Power Systems. There is some truth in that, but let’s take a look at a more recent result. In late 2011, HP published a 3-tier result of 175,320 DB SAPS[vi]. A direct comparison of old and new results show that the new result delivered 3% more performance than the old with 12 cores instead of 16 which works out to about 37% more performance per core. Admittedly, this is not completely correct as the old benchmark utilized SAP ECC 6.0 with ASCII and the new one used SAP ECC 6.0 EP4 with Unicode which is estimated to be a 28% higher resource workload, so in reality, this new result is closer to 76% more performance per core. By comparison, a slightly faster DL380 G7[vii], but otherwise almost identical system to the BL460c G7, delivered 112% more SAPS/core on the 2-tier benchmark compared to the BL680c G5 and almost 171% more per SAPS/core once the 28% factor mentioned above is taken into consideration. Once again, one would need to adjust these numbers based on differences in MHz and the formula for that would be: either of the above numbers * 3.06/3.33 = estimated SAPS/core. After one does this math, one would find that improvement in 2-tier results was almost 3 times the improvement in 3-tier results further questioning whether the 2-tier benchmark has any relevance to the database tier. And just one more complicating factor; how vendors interpret SAP Quicksizer output. The Quicksizer conveniently breaks down the amount of workload required of both the DB and App tiers. Unfortunately, experience shows that this breakdown does not work in reality, so vendors can make modifications to the ratios based on their experience. Some, such as IBM, have found that DB loads are significantly higher than the Quicksizer estimates and have made sure that this tier is sized higher. Remember, while app servers can scale out horizontally, unless a parallel DB is used, the DB server cannot, so making sure that you don’t run out of capacity is essential. What happens when you compare the sizing from IBM to that of another vendor? That is hard to say since each can use whatever ratio they believe is correct. If you don’t know what ratio the different vendors use, you may be comparing apples and oranges. Great! Now, what is a customer to do now that I have completely destroyed any illusion that database sizing based on 2-tier SAPS is even remotely close to reality? One option is to say, “I have no clue” and simply add a fudge factor, perhaps 100%, to the database sizing. One could not be faulted for such a decision as there is no other simple answer. But, one could also not be certain that this sizing was correct. For example, how does I/O throughput fit into the equation. It is possible for a system to be able to handle a certain amount of processing but not be able to feed data in at the rate necessary to sustain that processing. Some virtualization managers, such as VMware have to transfer data first to the hypervisor and then to the partition or in the other direction to the disk subsystem. This causes additional latency and overhead and may be hard to estimate. A better option is to start with IBM. IBM Power Systems is the “gold standard” for SAP open systems database hosting. A huge population of very large SAP customers, some of which have decided to utilize x86 systems for the app tier, use Power for the DB tier. This has allowed IBM to gain real world experience in how to size DB systems which has been incorporated into its sizing methodology. As a result, customers should feel a great deal of trust in the sizing that IBM delivers and once you have this sizing, you can work backwards into what an x86 system should require. Then you can compare this to the sizing delivered by the x86 vendor and have a good discussion about why there are differences. How do you work backwards? A fine question for which I will propose a methodology. The result is a ratio of 2.6, e.g. if a workload requires 10 IBM Power 740 3.55GHz cores, it would require 26 BL460c G7 cores. This contrasts to the per core estimated SAPS based on the 2-tier benchmark which suggests just that the Power 740 would have been just 1.4 time the performance per core. In other words, a 2-tier based sizing would suggest that the x86 system require just 14 cores where the 3-tier comparison suggests it actually needs almost twice that. This is, assuming the I/O throughput is sufficient. This also suggests that both systems have the same target utilization. In reality, where x86 systems are usually sized for no more than 65% utilization, Power System are routinely sized for up to 85% utilization. If this workload was planned to run under VMware, the number of vcpus must be considered which is twice the number of cores, i.e. this workload would require 52 cores which is over the limit of 32 vcpu limit of VMware 5.0. Even when VMware can handle 64 vcpu, the overhead of VMware and its ability to sustain the high I/O of such a workload must be included in any sizing. Of course, technology moves on and Intel is into its Gen8 processors. So, you may have to adjust what you believe to the effective throughput of the x86 system based on relative performance to the BL460c G7 above, but now, at least, you may have a frame of reference for doing the appropriate calculations. Clearly, we have shown that 2-tier is an unreliable benchmark by which to size database only systems or partitions and can easily be off by 100% for x86 systems.